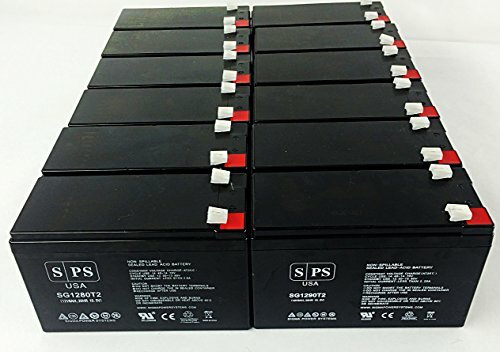 TWELVE 12V 8Ah rechargeable SLA batteries for Liebert GXT2-144BATKIT GXT2-144VBATT 12V 8Ah UPS Battery. Batteries supplied by RightPrice Batteries for Liebert GXT2-144BATKIT GXT2-144VBATT 12V 8Ah UPS Battery are of high quality, designed to meet or exceed original OEM specifications. They were manufactured by ISO certified companies. Spent batteries from Liebert GXT2-144BATKIT GXT2-144VBATT 12V 8Ah UPS Battery have to disposed properly as per local and federal regulations. Ask about our free battery recycling service. Replacement batteries for Liebert GXT2-144BATKIT GXT2-144VBATT 12V 8Ah UPS Battery carry ONE year full warranty and 30 days moneyback guarantee. Liebert GXT2-144BATKIT GXT2-144VBATT 12V 8Ah UPS Battery have one year warranty when used under normal conditions.